How to make flipbook flip automatically when start it? If there are so many product demonstrations on the flipping pages, you would love to make the flipbook itself flip automatically. You know if people view the cool flipping effect at the first sight, they tend to be interested in the content printed on the magic pages. You would think the content must be as interesting as the style of flipping which you do much effort on. It is possible that people like you because you really spend time on considering requires from customers. Now let’s learn how to make the flipbook demonstrate itself. Actually it also allows you flip with mouse. 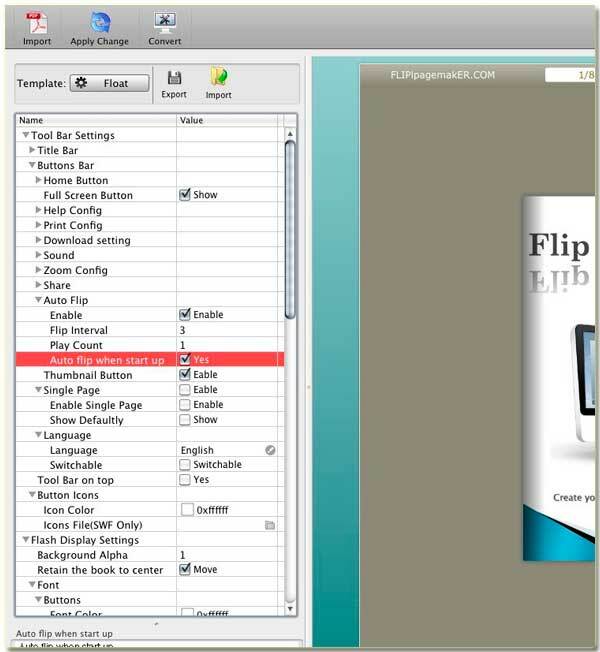 Step1: Launch FlipBook Creator for MAC, import a PDF for editing. Step2: That’s right! we should look at the left setting areas. Step3: Check the checkbox Auto flip when start up. Don’t forget click Apply Change on the top menu. After the flipbook generated, you can enjoy the gorgeous flipping effect.